Welcome back to the French Moments blog! As this is not the first time you are here, you may be interested in downloading the guide "20 Amazing Offbeat Places in Paris". Click here to get your free copy now! Like a fairytale castle, Chantilly is surrounded by a vast estate of 7,800 hectares, North of Paris. Technically, here we are in the Picardy region, but the town of Chantilly and its surrounds once belonged to the Île de France province. The Condé Museum is located inside the chateau and prides itself on being the most beautiful museum of old paintings after the Louvre: 1,000 paintings, 2,500 drawings and 2,500 engravings are exhibited here! It also possesses a very rich collection of rare and precious books (more than 30,000), most of which are exhibited in the chateau’s magnificent library. Despite its royal appearance, Chantilly never belonged to the kings of France, but rather to the illustrious noble families that were often related to the monarch. There is nothing left of the medieval chateau, except for the bases of the circular towers, which are still beneath the moat. The chateau belonged successively to the Orgemonts (14th-15th centuries), the Montmorencys (15th-17th centuries), Le Grand Condé (the King of France’s cousin, in the 17th century), then to Henri d’Orleans, duke of Aumale (1822-1897), son of King Louis-Philippe. The equestrian statue (1886) erected on the terrace at the chateau’s entrance is that of Constable Anne de Montmorency (1493-1567), comrade in arms of Francois I and Henry II. The master of Chantilly transformed the medieval chateau into a Renaissance residence. After having rebelled against his cousin, King Louis XIV, Louis II de Bourbon-Condé (1621-1686), also known as Le Grand Condé, was advised by Louis XIV to go and “relax” in Chantilly. He used this time to his advantage by transforming the territory by enlisting the famous architect, André Le Nôtre, to design the gardens. A descendant of Le Grande Condé, Louis-Henri de Bourbon-Condé (1692-1740), Prime Minister during the reign of Louis XV, had the famous Great Stables built by Jean Aubert. His son, Louis-Joseph de Condé (1736-1818), built the Chateau of Enghien (located to the right of the Gate of Honour) built by Jean François Leroy from 1769 to 1772. In 1774, he had the Anglo-Chinese garden and the nearby Hamlet, a group of five rustic houses, designed. It is this concept that later inspired the Hamlet of Queen Marie Antoinette in Versailles. Louis-Joseph exiled himself from France after the taking of Bastille and in 1792 formed the army of emigration, known as the Army of Condé. The Revolution did not spare Chantilly. Its incredible collections were seized and transported to the Louvre. After having been used as a prison, the buildings were sold in 1799, the great chateau demolished and the park ravaged. The Napoleonic era over, Prince Louis-Joseph returned to France and had the chateau partially restored and equally succeeded in recovering some of the collections from the Louvre. The chateau was then returned to Henri d’Orleans, duke of Aumale, then aged 8, a distant member of the prince’s family, and future Governor General of Algeria. Upon entering the chateau, visitors are amazed by the reception room that serves as the central point for guided visits of the apartments, the chapel and various rooms exhibiting the art collections. You must wait for announcements of when the next group visits to the apartments leave. This can be accessed by the stairs located behind the door to the left of the fireplace. This room of great sobriety was created in 1876-1877 by the Duke of Aumale to house his vast collection of books, while also being a place of reading and of work. Look at the ceiling which is decorated with the coats of arms of Le Grand Condé’s comrades in arms. The collection of books extends to 13,000 volumes, 1,500 manuscripts and 11,500 prints, the texts of which are mostly literary and historic. It is here that the most famous – and the most precious – medieval manuscript: The Very Rich Hours of the Duke of Berry, is kept. But the one that you can look at in a cabinet in the library is only a display copy. The guided visit commences from the Anteroom and the Guard room. Despite their appearance, these rooms are not old: they date from the 19th century. The Duke of Aumale wanted them to link the Grand and Petit Chateaus, which were originally separated by a moat. The panelling of this room dates from 1720. The white and gold panelling, which accompany hunting decors, were popular at the beginning of the 18th century. This is certainly the most original room of the chateau. It is entirely decorated in mural paintings representing monkeys engaging in different activities. The monkeys and the Chinese magots were also popular in decorations of private houses or chateaus in the 18th century. The Grand Condé wanted this room to show off in front of his visitors… and it is still as impressive to us today! The long room contains eleven canvases depicting the Prince’s greatest military victories: Speyer, Landau, Freibourg, etc. He did not live to see the accomplishment of this final project, as he died in 1686, 6 years before the works were finished. The furniture comes from the Games Room of the Chateau of Saint-Cloud, near Paris, which no longer exists. These rooms are located to the right of the entry hall and can be visited without a guide. Many French people will recognise the paintings made famous by their school history books. We are in France’s second best museum of old paintings, after the Louvre. This immense reception room was created at the end of the 19th century. Superb medieval tapestries hang on these walls. It contains Italian paintings on the left wall and French paintings on the right. Several historic French portraits from the 17th and 18th centuries, now famous, represent Richelieu, Mazarin or Marie Antoinette. You can also admire the Delacroixs here as well as the portraits of the Duke of Aumale. This hallway is appreciated much more when you know the origin of its 44 stained glass windows in grisaille. These date from the 16th century and depict the story of Psyche. Originally from the Chateau of Ecouen, these windows are the ancestor of comic books and narrate a mythological love theme that was fashionable in the Renaissance. Built in 1882 by the Duke of Aumale, the chapel is dedicated to Saint-Louis. Originally, another chapel stood on the same site, but it was destroyed in the Revolution. Several elements of the chapel (windows and furniture), however, date back earlier than 1789 and come from the Chateau of Ecouen. The windows date from 1544 and represent the sons of Constable Anne de Montmorency protected by Saint John (to the left) and his daughters and wife protected by Saint Agatha (to the right). 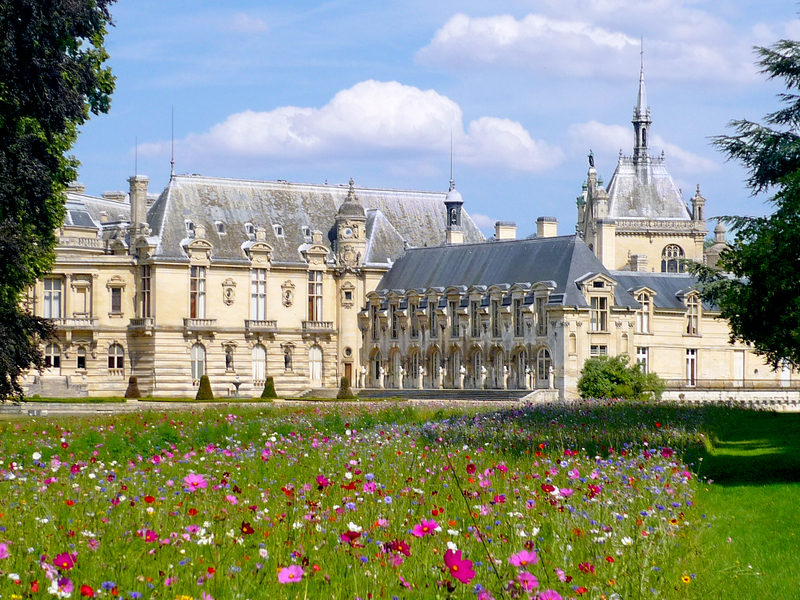 As famous as those of Vaux-le-Vicomte and Versailles, the estate of Chantilly leads the wanderer on a discovery of unusual places, a hamlet and oriental follies. Le Nôtre transformed the site of Chantilly from a swamp into an enchanting place where an increasing number of parties, fireworks, concerts and balls brought joy to the princes of Condés’ guests, which included Molière, La Fontaine, La Bruyère and Madame de Sévigné. The chateau’s park is composed of 4 major spaces in which visitors make surprising discoveries. It is the closest garden to the chateau, created by Le Nôtre (end of the 17th century) for Le Grand Condé. It is the only garden by the famous landscape gardener whose axis does not pass by the chateau, but by the equestrian statue of Constable Anne de Montmorency sitting imposingly on the terrace. The great perspective designed by Le Nôtre commences from the gate of honour to the statue of the Constable and goes on by crossing the French-style gardens and the Grand Canal to lead into the forest. Le Nôtre had the idea of canalising the little river of the Nonette to create the Grand Canal of Chantilly, whose length (2.5km) greatly surpasses that of the canal of Versailles. The garden bed to the north of the chateau is made up of water-jets and vast ornamental ponds reflecting the sky. Built in 1820, the English Garden features majestic trees as well as symbolic monuments: mythological temple, cascades and the Isle of Love. The Isle of Love is a strip of lawn lined with fountains and boxwood surrounded by water. It finishes with a trellis gazebo in which the statue of Eros is found. The Temple of Venus is a folly erected at the beginning of the 19th century on the edge of a romantic lake where swans swim. It was inspired by Greek or Roman temples and houses in its centre an antique statue representing Venus, the Goddess of Love. This is a large fountain designed by Le Nôtre in the 17th century, which is unfortunately out of order. The Hamlet dates from 1775 and influenced that of Marie Antoinette at Versailles. Composed of 5 Norman cottages, the Hamlet was fashionable for nobles seeking a change of scenery in villages in miniature. They would travel there from elsewhere in “dugouts”, spraying themselves heartily amid laughter. Servants would dress up as peasants and shepherdesses, and sing while welcoming visitors. Today, the water mill is home to a restaurant where you can taste the famous Chantilly cream. Almost the entire Anglo-Chinese garden that surrounded the Hamlet has disappeared. It remains nonetheless a romantic and cool place and an islet in the middle of a little lake. Backing onto the forest, this large, long building dating from 1769 served to welcome the numerous guests of the princes of Condé. The chateau was not large enough to accommodate all of the Princes’ guests, who came here to participate in parties and hunting. It was in 1719 that Louis Henri de Bourbon, the seventh Prince of Condé, built the stables worthy of his rank. The stable buildings measure 186 metres in length and have more the allure of a chateau than of a stable. The building housed up to 240 horses and several packs of dogs (up to 500 in each). The Great Stables were left to the Institute of France in 1884 by the Duke of Aumale, which explains their good preservation to date. Since 1982, they have housed the “Living Museum of Horses”, and much like the chateau, are one of the most popular attractions in the region. Take the motorway A1 in the direction of Lille. Take exit no 8 (Senlis) in the direction of Apremont-Creil. On the RD 1330, follow Apremont (left) and then Vineuil-Saint-Firmin. Take the motorway A1 in the direction of Paris. Take exit no 8 (Senlis) in the direction of Apremont-Creil. On the RD 1330, follow Apremont (left) and then Vineuil-Saint-Firmin. There is a direct train to Chantilly (Travel time is approximately 25 minutes).On your arrival to Chantilly’s train station, you can either call a taxi or take buses to the site of the castle. To know more about the conditions of visit of the Chantilly Castle, go to the official website of the castle.